If there is one species of pest that makes a good vector for tick diseases, it is the tick themselves – almost all types of them. It is the main reason for illnesses brought about by these annoying blood suckers especially in tick-prone regions. Alarmingly, there are more than 800 species of them. Ticks need to consume blood for their existence and so that they can move on to the next stage in their life cycle. Not by choice but because of this need that they pass on the pathogens that cause tick-borne diseases. The type of infection may depend on the type of tick that transmits the germs. 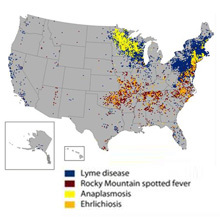 There is a collection of pathogens that ticks carry and pass on to their host resulting to tick diseases known in North America such as Colorado tick fever, Rocky Mountain spotted fever, Relapsing fever, Human granulocytic and monocytic ehrlichiosis, Q fever, Tularemia, Babesiosis and Lyme disease. The same diseases are found in the European region with the addition of tick-borne encephalitis and Boutonneuse fever said to be caused by an organism called Rickettsia conorii. Despite the truth about ticks causing the said diseases, it is not always the case in each biting incident. Lyme disease for instance only happens to about 3% of Deer ticks bite victims. The transmission of pathogens may depend on the type of tick and the length of exposure. Immediate removal of an attached tick may prevent a possible infection. Lyme disease – transmission is through the bite of the black-legged tick caused by the agent spirochete Borerelia burgdorferi or B. burgdorferi. It is prevalent during the months of May to August when most people are outside for summer fun and activities. It is also the season of warmth when ticks thrive the most. Rocky Mountain spotted fever – there are several ticks that may cause this disease namely: the brown dog tick, the American dog tick and the Rocky Mountain wood tick. This disease is prevalent in almost the whole of America but recently, most cases are reported in the western and south central states. Like most tick diseases, this also has an incubation period but abrupt fever begins within 5-7 days after a bite and often goes with severe headache and nausea, abdominal pain and diarrhea. Rash may begin on the first day or until the 15th day after the start of the illness. Ehrlichiosis – the south-central and eastern lone star tick is the source of this illness which is similar to Rocky Mountain spotted fever. The illness could occur within 1 to 21 days after a bite. Babesiosis – transmitted by the Black-legged ticks mostly of the Northeast and upper Midwest, this disease targets the red blood cells to cause an infection. Tularemia – the sickness generally takes 3-5 days before symptoms show characterized by high fever and chills, fatigue and headache, among other signs typical on most tick diseases. The severity of this disease transmitted by the dog tick, the wood tick or the lone star tick may depend on several factors. Tickborne relapsing fever – this is said to be transmitted by the soft shell ticks in which the illness comes with the usual fever, headache, abdominal pain, melancholy, etc. Not all cases develop the expected rash. Colorado tick fever – is a severe kind of tick-borne illness that recurs in about 50% of patients 3 days after symptoms show some improvement. Known previously as Mountain fever, it takes up to 6 days before the signs show including photophobia and may continue to persevere up to 8 days. Tick paralysis – while mostly reported in animals, there was a time when this illness was also experienced by humans in the early 1900s but very rare. Other known tick diseases include the Powassan, experienced by some black-legged tick bite victims and the Southern Tick-Associated Rash Illness (STARI) coming from the lone star tick reported mostly in the eastern and southeastern America. There is also the sickness called Rickettsia that is caused by the Gulf Coast tick. In 2009, several states in America reported an emerging tick-borne disease called the Anaplasmosis whose causative agent is the Anaplasma phagocytophilum. This is previously known as the Human Granulocytic Ehrlichiosis which is an infection of the white blood cells. Its spread is not caused by a single tick but several types depending on which part of the US an infected person is from. According to experts though, the blame is primarily on the black-legged ticks. Similar to the symptoms of other tick diseases, infected people also experience fever, nausea, headache, diarrhea but also other flu-like and respiratory symptoms. Aged patients and those whose immune response is suppressed by some drug intake or radiation suffer more severe symptoms. Researchers are studying a kind of bacteria that was said to have been initially identified in Japan in 1995. The symptoms are very similar to those of Lyme disease and Anaplasmosis and it is feared to mislead some doctors into correctly diagnosing the disease. The bacteria, however, said to have been found on black-legged ticks, remain uncommon and quite easy to treat as patients respond fairly to doxycycline. Still, with the existing tick diseases already being tackled by doctors, B. miyamotoi is causing an alarm among experts who are only starting to discover infected people in the recent years and more are suspected to be infected in the coming years. With most of the means of transmission already established saved for the case of the B. miyamotoi, preventing the presence at home of all types of ticks and avoiding exposure to them will be anyone’s most effective defense. People living in tick-prone areas must observe and apply necessary precautions to avoid being bitten by ticks and thereby avoid tick diseases. And in case of a bite and an infection is suspected, it is best to play it safe by seeing a doctor.